They never change a thing in the budget that people suggest because they think they are always right. No one asked me if I want gazillions spent on Booran or more car parking in our parks. You’re right on the old Booran Reservoir site, the then Cr.Tang and his ilk tried to rig the process from a very start so they could deliver the site lock stock and barrel to their soccer mates. Eventually the residents were asked, and council delivered something totally different than expected. Having one seventh of the site locked off from public access was never envisaged, discussed or thought necessary in the consultation process. 11,12, 13 million dollars spent only to have one seventh of the site wasted behind locked gates, off limits indefinitely apparently. This is a huge bureaucratic blunder in the city with the largest open space shortage in “Australia” according to Cr. Magee. Council’s response to a recent public question is that the so called ‘urban forest’ will remain out of bounds to residents “for the forseeable future”. The ag has nailed it. The rules are abided by but nothing else. Imagine if the majority of residents actually had a say. I predict that we would have an entirely different budget and that wouldn’t suit council and its grand spending sprees. Quote from the AG Report – “The council plan is a council’s key medium-term strategic plan. It should reflect the vision and aspirations of the community and capture the character and identity of the municipality. The current council plans cover the period 2013–2017. 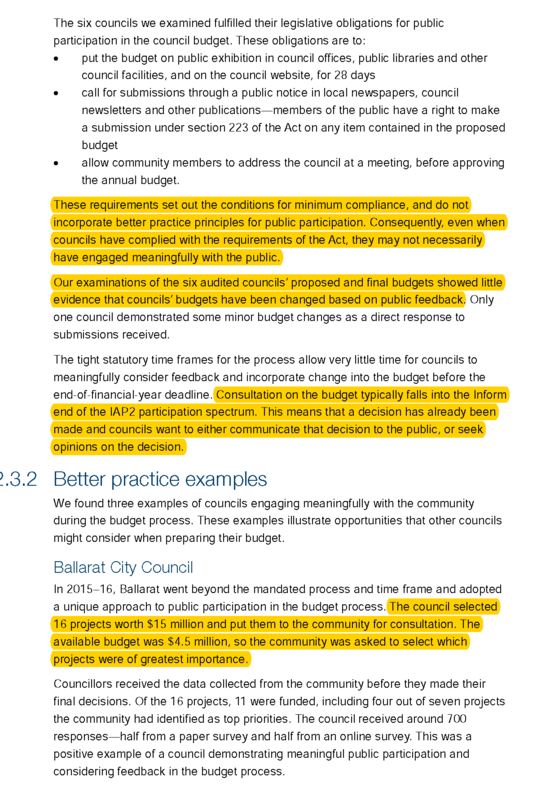 Although the council plan is supposed to reflect the community’s vision and aspirations, the six councils we examined do not proactively consult with their communities” In other words they (the bureaucrats) just made up the community vision to suite their own means and ends. This situation sounds very like Glen Eira machinations with their community consultation processes. What this report didn’t consider was; is the corporate governance model the best model to actually govern or deliver a truly consultative process, or even manage the governance of a community. Successful corporation may be able to deliver profits to their shareholder, and excessive salaries to their managers. Corporations have never claimed to be democratic or fair, and because of past abuses there is a growing body of regulatory law to protect people from their worse excesses and autistic behaviours. Democracy and fairness is not and never has been their core business of any corporate model. One avenue of enquire could have been Is delivering democracy, balance and sustainability to a rapidly growing population possible achievable under a corporate hierarchical model, were residents are often seen as the enemy, and elected councillors as a sideshow problem or even worse. Community consultation, democracy, sustainability the protecting our natural environment are seen as burdens that drain away money from their big spending infrastructure projects It’s a bit like getting the fox to guard the chickens; it’s just so much easier for the bureaucrats to go in with a predetermined plan, rig the consultation processes, twiddle the stats to mimic successful outcome. Without serious regulation coupled with high levels of accountancy that will holds the senior mangers methods and behaviours to account; very little, to nothing will change, except for the ever increasing costs of everything they meddle with, along with increasing community friction and disillusionment with our poor levels of governance and their hollow processes. It is high time that the Inspectors and Ombudsman descend on Glen Era City Council as residents are disgusted the way the Council has been running for the last 5 years. Shocking is a mild word.